Claude Cohen-Tannoudji is an atomic physicist at Collège de France. He was awarded the 1997 Nobel Prize in Physics "for development of methods to cool and trap atoms with laser light." April 01, 1933Birth, Constantine (Algeria). 1964Obtained PhD in Physics, Ecole Normale Supérieure (ENS), Paris (France). 1964 – 1973Professor, Université de Paris (University of Paris), Paris (France). 1973 – 2004Professor of Atomic and Molecular Physics, Collège de France, Paris (France). 1981Member, Académie de sciences (French Academy of Sciences). 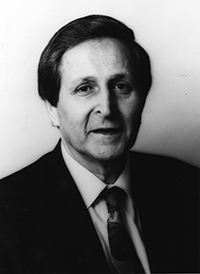 1992Awarded Lilienfeld Prize, American Physical Society. 1993Awarded Charles Hard Townes Award, Optical Society of America. 1994Awarded honorary doctorate, Uppsala universitet (Uppsala University). 1994Foreign Associate, National Academy of Sciences. 1997Awarded Nobel Prize in Physics "for development of methods to cool and trap atoms with laser light". 1999Member, Pontificia Accademia delle scienze (Pontifical Academy of Sciences). Shared the 1997 Nobel Prize in Physics along with William D. Phillips "for development of methods to cool and trap atoms with laser light". Advised by Cohen-Tannoudji at Ecole Normale Supérieure (ENS Paris). PhD advisor at École Normale Supérieure. Professor of Atomic and Molecular Physics. Obtained PhD in Physics (1962). Fellow and awarded 1992 Lilienfeld Prize. Awarded 1993 Charles Hard Townes Award. Atom-photon interactions: basic processes and applications/ Claude Cohen-Tannoudji, Jacques Dupont-Roc, Gilbert Grynberg; [translation by Patricia Thickstun]. Optique et électronique quantiques: Quantum optics and electronics. Lectures delivered at Les Houches during the 1964 session of the Summer School of Theoretical Physics, University of Grenoble/ edited by C. DeWitt, A. Blandin, C. Cohen-Tannoudji. Photons and atoms: introduction to quantum electrodynamics/ Claude Cohen-Tannoudji, Jacques Dupont-Roc, Gilbert Grynberg. Quantum mechanics/ Claude Cohen-Tannoudji, Bernard Diu, Franck Laloë; translated from the French by Susan Reid Hemley, Nicole Ostrowsky, Dan Ostrowsky. Claude Cohen-Tannoudji Nobel Prize biography.